Border officials announced last week that our southern border is at a breaking point. Almost 100,000 people illegally crossed the border this month and Homeland Security believes a million people will cross illegally this year. 12,000 migrants are in custody in El Paso. To provide perspective, border patrol officers there said this week that 4,000 is extremely high – 6,000 is a crisis and 12,000 is unprecedented. Nearly a dozen immigration checkpoints along our southern border were closed this week, as hundreds of border patrol agents were pulled from other ports of entry to help in El Paso. In the Rio Grande Valley, border officials say they have been forced to release undocumented immigrants because of the massive influx. Incredibly, some left-wing progressives continue to ignore the skyrocketing numbers, calling it a “manufactured crisis,” but in Texas, we know the crisis is real. Since I have been Lt. Governor, I have allocated $1.6 billion in the budget for additional boots on the ground at the border as well as boats and other surveillance equipment. We have put an additional $800,000 in the new budget. Yesterday, Beto O’Rourke said illegal immigration make us safer, even though drug dealers, gang members and other criminals are among those who are crossing the border illegally. In fact, the drug cartels control illegal crossings through extortion and worse. 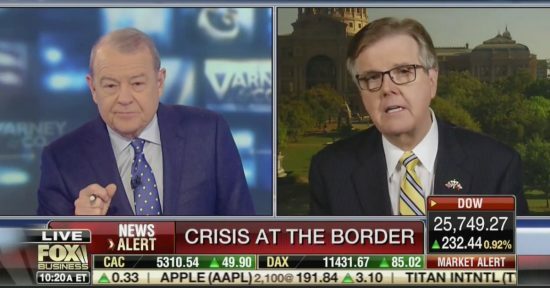 I was on Varney & Co last week talking about the crisis at the border. In case you missed it, you can watch the interview here. 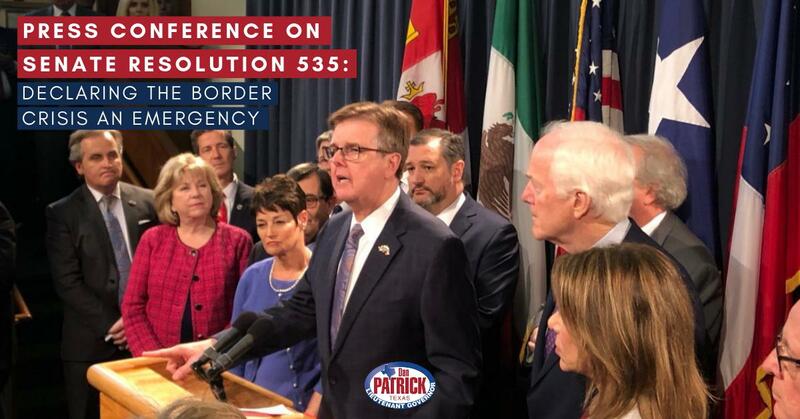 Texans support President Donald Trump’s charge to secure the border, including building a wall in places where it is desperately needed. 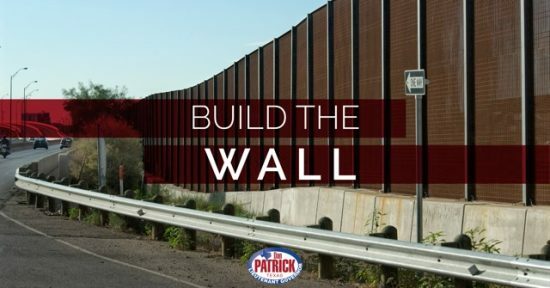 If you agree that securing the border is essential to keep Texas communities safe, sign your name to our petition. Human trafficking is just one by-product of the failure to secure our border. It is yet another reason we must build the wall. There are over 234,000 victims of human trafficking in Texas at any given time. Last week, the Texas Senate unanimously passed Senate Bill 20 – the Stop Human Trafficking bill, authored by Sen. Joan Huffman, R-Houston. SB 20 strengthens penalties for human traffickers and will help us prosecute this heinous crime. Read my official statement on the passage of the Stop Human Trafficking Act here. Ending taxpayer funded lobbying is a priority for me. I know many of you were outraged in February during hearings on the property tax reform bill when dozens of taxpayer funded lobbyists showed up at the Texas Capitol to testify AGAINST letting taxpayers vote if local entities raise your taxes by more than 2.5%. Almost 100 people testified IN SUPPORT of reining in property taxes and none of them got paid to do it. 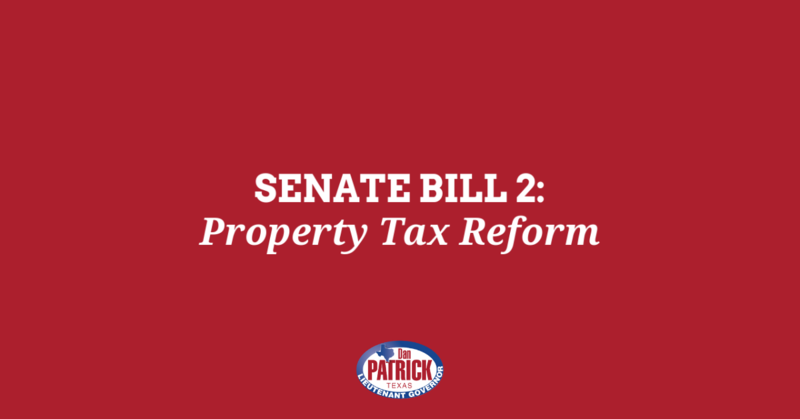 Senate Bill 29 – by Senator Bob Hall, R-Edgewood, will end taxpayer funded lobbying. 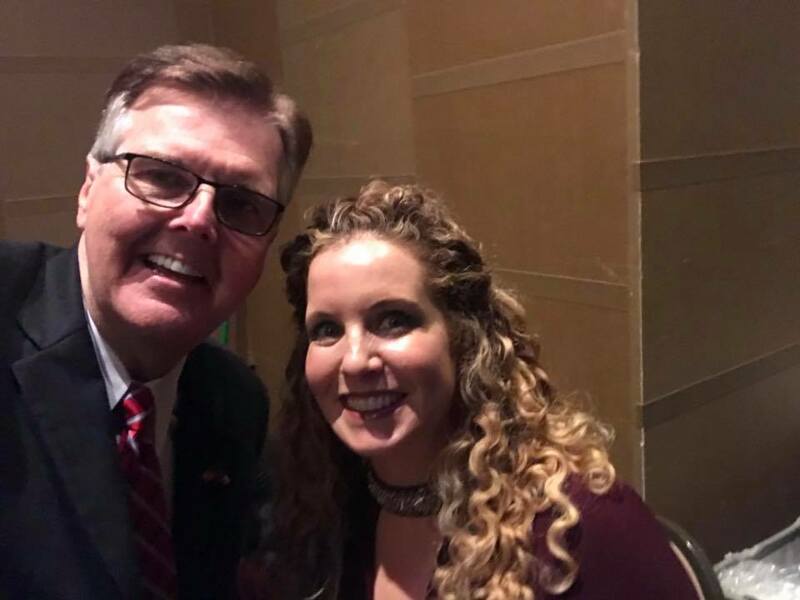 We also got another victory in this fight this week when Senate Bill 702, by Senator Paul Bettencourt, R-Houston, passed the Texas Senate. SB 702 will require every taxing jurisdiction to report how much money they are spending on lobbying. Taxpayers have a right to know, and this bill will make sure the information is clear and easily accessible online. 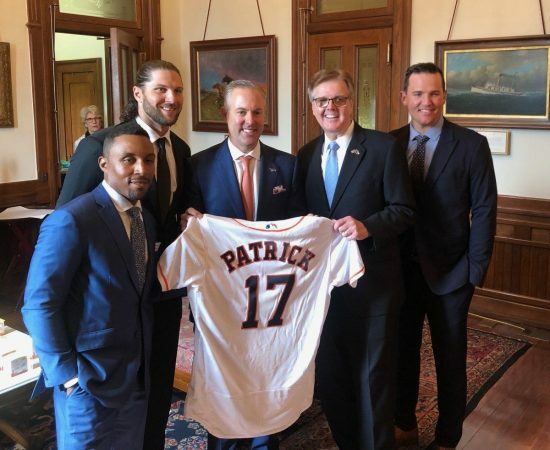 The Texas Senate honored the Houston Astros for their 2017 World Series win last week with a proclamation on the Senate Floor. The Astros are a team of champions that has won the heart of Texas and the rest of the world. I was honored that the players presented me with a team jersey and I am all in to “Take It Back in 2019.” Here’s the photo.